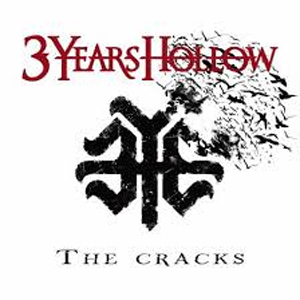 Merging intensity with melody, 3 YEARS HOLLOW plans to spread their rabid Quad Cities fanbase throughout the rest of the US and beyond, with an upcoming tour (alongside SAVING ABEL - with additional dates to be added), and their upcoming release, The Cracks, which drops on February 11, 2014. The twelve-track release will be the group's full-length debut for Imagen Records, and was produced by none other than SEVENDUST guitarist/songwriter Clint Lowery (Lowery also guests on a track, "For Life"). "We want to play melodic hard rock," explains singer Jose Urquiza. "That's the music that brought us together. At the same time, we all have drastically different influences from progressive rock to hair metal to pop punk." Comprised of Urquiza, Tony Reeves (guitar), Neil Kuhlman (guitar), Dex Digga (bass), and Chris Cushman (drums), 3 YEARS HOLLOW has already enjoyed success on such stations as Sirius XM Octane, which added the song, "Remember" (of which a remastered version resides on The Cracks) to their rotation. Soon after, the song hit #1 on the channel, while all of the group's videos have attracted nearly 500,000 YouTube views. Also included is the aforementioned "For Life", of which Urquiza describes as "It's about a person who is struggling and has fallen away from the world alone. You can see the damage and the demons the person deals with on a daily basis. However, all of a sudden, there is hope instead of despair. The final message is to pull away from the demons, stand strong against them, and keep them out for the rest of your life. It was such an honor to bring that track to life with Clint." Instead of setting up shop at a single recording studio, it turns out that the sessions for The Cracks occurred at several different studios, including Groovemaster Studios (where DISTURBED, SEVENDUST, and POP EVIL have all recorded) in Chicago, IL, Trailer Studios in St. Louis, MO, and the band's own studio, Real Trax Recording, in Davenport, IA. According to Urquiza, it is also the realness of his lyrics that resonate greatly with fans. "Everything I write about is a completely personal experience or something I've witnessed or experienced myself. I talk about things I've seen or experienced. I want to give everybody something real." 2.21 - Bismarck, ND - O.N.E.